From Newbery Medal winner and bestselling author Sharon Creech comes a grand, sweeping yarn that is a celebration of the great and unexpected gifts of love, friendship, and forgiveness. 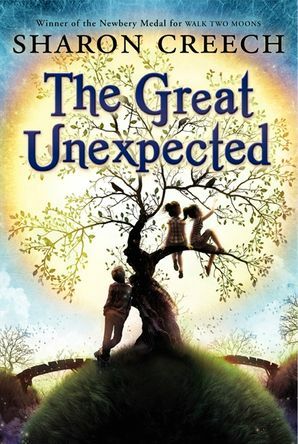 With a starred review from Kirkus Reviews calling it an "enchanting tale to treasure," The Great Unexpected captures the heart and the imagination. Humorous and heartfelt, this is a story of pairs—of young Naomi and Lizzie, both orphans in present-day Blackbird Tree, USA, and of Sybil and Nula, grown-up sisters from faraway Rook's Orchard, Ireland, who have become estranged. Young Naomi Deane is brimming with curiosity and her best friend, Lizzie Scatterding, could talk the ears off a cornfield. Naomi has a knack for being around when trouble happens. She knows all the peculiar people in town—like Crazy Cora and Witch Wiggins. But then, one day, a boy drops out of a tree. Just like that. A strangely charming Finn boy. And then the Dingle Dangle man appears, asking all kinds of questions. Curious surprises are revealed—three locked trunks, a pair of rooks, a crooked bridge, and that boy—and soon Naomi and Lizzie find their lives changed forever. As two worlds are woven together, Creech reveals that hearts can be mended and that there is indeed a gossamer thread that connects us all. That bothered me. 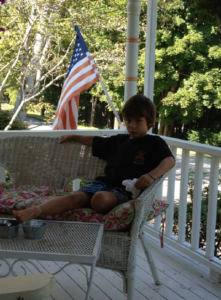 When I was young and when my children were young, the unexpected was exciting: Visitors! A trip! Surprises! I wondered if we adults and the media were passing along our own worries, taking the excitement out of the unexpected. I wanted to restore some of that excitement. The third: Rolling around in my brain for a long, long time has been an interest in odd coincidences and in the many ways in which we are all connected – some of these connections become apparent to us, and some may never be known. I like the intrigue of that discovery and that continued mystery and seem to explore some version of this in most of my books. These three elements rumbled in my mind for years, until they mashed up with images of a girl named Naomi, a boy named Finn, a cranky old lady, a crooked bridge, rooks, a small American town and an Irish village. And so emerged this story wherein fantasy and reality merge, where connections surface between seemingly distant people, places and things, and where the unexpected can be great. > Listen to the beginning of The Great Unexpected—read by me! A beagle and cows are important to the boy in this story. I knew that the beagle was inspired by my sister’s dog, but I had no idea where the cows came from. 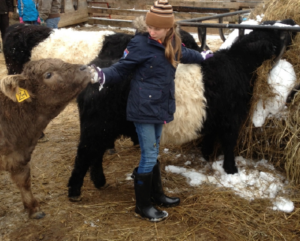 Ironically, six months after finishing The Boy on the Porch, my granddaughter started working on a cow farm where she became especially attached to one particular cow and where she regularly draped herself across its back, much as the boy in the story ‘rides’ the cow.